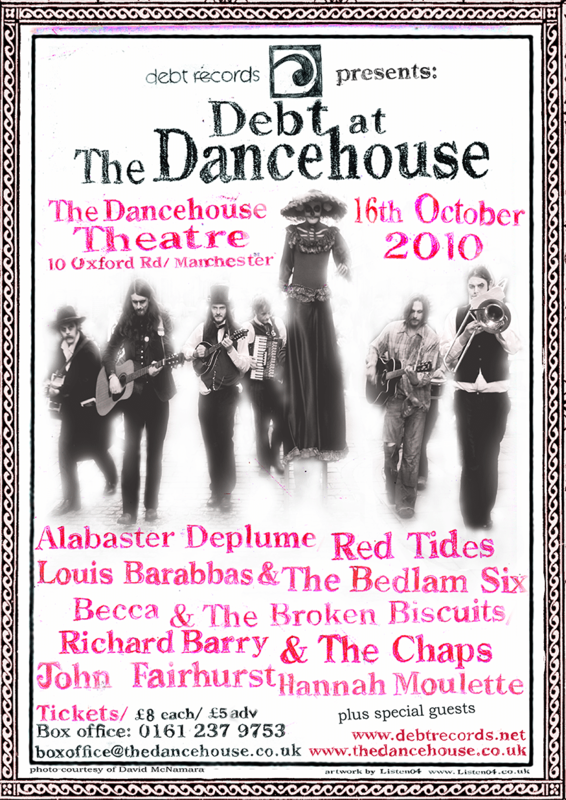 On Saturday 16th October 2010 – as Manchester’s In The City delegates nurse their wine-hangovers and fringe promoters stack up the unused chairs – Debt Records will throw open the doors of the beautiful Dancehouse Theatre for its annual live extravaganza. For one night only, the Northern Ballet School’s sumptuous art deco headquarters will be transformed into a hub of independent music and performance, brought to you by Manchester’s cooperative imprint Debt Records. Debt is a label ready to admit that the music industry is currently in a condition whereby live performance is, for the first time since the formation of EMI in 1931, the only dependable way in which a artists can realistically and sustainably ply their trade. What better place then to hold this independent label’s annual party than in the splendour of a 1930s proscenium arch auditorium? The timing is not insignificant. The three day ITC conference that precedes Debt At The Dancehouse is a world famous music industry event that will facilitate (albeit naively) many local bands being seduced into performing for no pay by fringe promoters promising them the attentive ears of hungry and sympathetic industry representatives (who, in reality, will all be half a mile away in a hotel getting drunk). Debt Records is not opposed to the ITC conference – indeed a number of Debt associates are taking part and Debt’s technical director Dan Watkins is on the team recording the event – but this showcase will be an antidote: an evening of exceptional entertainment free from agenda or artifice. The Debt Records team believes that no space should be ignored when planning a concert. They have to date performed and organised shows in museums, churches, libraries, olive groves and derelict buildings but, for their yearly label celebration at least, they prefer to be old fashioned: a theatre is the proper place for an evening’s entertainment, especially in a time when the world outside seems so uncertain. According to BBC Manchester, last year’s Debt At The Dancehouse elicited “a general feeling of bonhomie”. This is precisely the sentiment musical performance should be associated with rather than the commonly accepted posturing of the recorded industry. It is with a spirit of inclusion – as well as independence – that Debt Records is run. Come see for yourself on 16th October 2010. £5 advance; £8 on the door. Tickets available in person from the box office (0161 237 9753) and online.